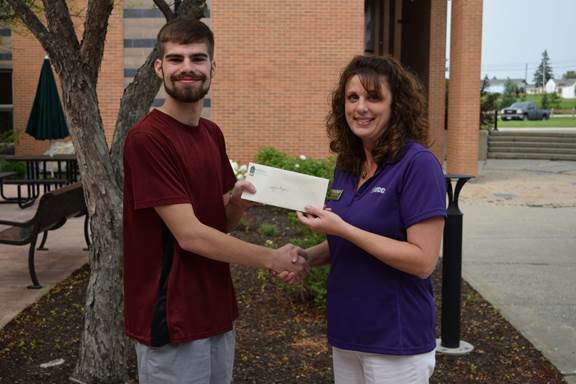 Tyler Lajoie (left) accepts one year’s free tuition at NMCC from Wendy Bradstreet (right) who purchased the winning lottery ticket on his behalf. PRESQUE ISLE, Maine — On Friday, Aug. 24, Tyler Lajoie, 20, scrambled to get his parents out of his Andrews Hall dorm room to attend new student orientation at Northern Maine Community College. “We were running late,” his mother, Lynn Lajoie of Fort Kent, explained. Meanwhile, in the Edmunds Conference Center on the other side of campus, orientation had already begun. To kick things off, NMCC President Timothy Crowley and Dean of Development Dr. Dottie Martin announced the winner of the 2018 Free Tuition Raffle: Tyler Lajoie. The room was silent, as the recipient was not in attendance. Running down the hallway towards the conference center, Lajoie and his family encountered the resident advisor (RA) from Andrews Hall: “You won free tuition for the whole year,” the RA shouted. “It caught me by surprise,” said Lajoie after the event, especially because he hadn’t actually purchased any raffle tickets. During the admissions process at NMCC, Lajoie made a strong connection with Wendy Bradstreet, director of admissions and outreach at the college. When it came time for the free tuition raffle, Bradstreet decided to purchase two tickets at $10 apiece — not for herself, and not for her son (he already graduated last year), but for Tyler Lajoie, the son of a hardworking family in Fort Kent. Having never won anything significant in his life, Lajoie still sat in shock hours later, “Did that just happen?” he asks, only half-kidding. Lajoie’s mother is a barber in Fort Kent and his father, Luke Lajoie, owns a computer and electronics store called GEIPC. “We’re still in awe,” his parents added. The free tuition will go towards Lajoie’s degree in computer and network technology. His first class was Monday, Aug. 27. Regarding future career aspirations, Lajoie said he would like to work at his father’s store in Fort Kent, hoping eventually to follow in his father’s footsteps and own the store. Submitted by the Development and College Relations Office of Northern Maine Community College.